The murder of students in Guerrero is raising questions once again about the complicity of law enforcement and public officials in Mexico's drug wars. Following a week of accolades abroad, President Enrique Peña Nieto returned home to face the worst political crisis of his administration. Protests rage after local police forcibly disappeared forty-three students of Ayotzinapa, a rural teaching college in the southern Mexico state of Guerrero. As the investigations continue, the crisis has laid bare the violence and corruption that control large parts of the nation. Led by youth, protesters across the country blame the government for the attack and others like it. As the father of one of the missing students said, “The government knows where they are.” His tone expressed deep fatigue and even deeper pain. Nearby, a third attack—on a local soccer team possibly made up of Ayotzinapa students as well—left another youth dead. Videotapes in the hands of the Guerrero state prosecutor’s office reportedly show that local police also participated in this attack, which appears to be a case of mistaken identity. Federal police arrived at the scene at least two hours later and refused to tend to the wounded. By all accounts, law enforcement agents limited their activities to firing on the students and carrying off the forty-three who are now disappeared. No law enforcement officials—at local, state or federal levels—protected the young people under attack, despite massive deployment to fight the war on drugs. Survivors report that they carried the wounded to a nearby army base, where army personnel refused to aid them. Not one soldier stepped forward to try to stop the massacre of the youth. To make matters more complex, within that debate there is a consensus that the line between organized crime and government in the city was long ago erased by collusion between the two. The attorney general recently announced that investigations showed that the mayor of Iguala ordered the attack on the students. He is accused of having close ties to the regional organized crime cartel Guerreros Unidos, allegedly run by his wife’s brothers until two of them were assassinated and the third went into hiding. The local, state and federal governments have been hostile to the rural school for years. Founded in the post-revolutionary period for children of peasant families, the school has staunchly defended revolutionary values as a series of governments has moved to privatize, globalize and atomize Mexican society. The students protested the recent education reforms modeled after US programs. When they were attacked, they were raising funds to participate in a march to commemorate the October 2, 1968, massacre of students at Tlatelolco in Mexico City. Young men from impoverished rural families with revolutionary ideals and a penchant for direct action are the natural enemies of politicians building new kinds of state-business ties—especially ties that include the business of illegal drug trafficking. The criminal group Guerreros Unidos, an ultraviolent splinter from the Beltran Leyva cartel, had a less obvious motive to abduct the students but more capacity to carry out the crime. The history of Guerreros Unidos reveals the insanity of the war on drugs. As US-backed security forces arrested or assassinated successive cartel leaders to enforce US prohibition, the splinter groups went rogue and used territorial control as carte blanche for any criminal activity that benefited them. Embroiled in a turf war with Los Rojos in Chilpancingo, the Guerreros Unidos could have ordered the hit for a number of reasons without necessarily thinking through the consequences, which now include fifty members of their cartel arrested in the past three weeks. Regardless of the actual interplay between state and criminal organizations, this is typical of youth reaction in Mexico. In marches and on social networks, young people express a sense of being under attack. The Ayotzinapa massacre and disappearances occurred just months after the army killed twenty-two youth in Tlatlaya in circumstances that suggest extrajudicial executions. In Iguala, reality reared its ugly head just as the international press was tripping over itself to praise the well-groomed president. The Peña Nieto administration has spent millions of dollars to improve its image, hiring the US lobbying firms Chlopak, Leonard, Schechter & Associates and APCO public relations, among others. Part of that effort has been a calculated move to downplay the violence as well as the war on drugs of Peña Nieto’s predecessor, which had become a political liability. The US government has encouraged a new public emphasis on economic reforms and cultural ties, while still directing the majority of its aid to the war on drugs. But despite his overdue declarations to investigate and punish the perpetrators of the Ayotzinapa attack, Peña Nieto has a dilemma on his hands. A full investigation and prosecution would undoubtedly touch members of his own cabinet—particularly Attorney General Jesus Murillo Karam and Secretary of the Interior Miguel Angel Osorio Chong. The attorney general’s office allowed Iguala mayor José Luis Abarcato to escape and now admits there were errors in digging up twenty-eight bodies from a clandestine grave that informants said were the students. Murillo Karam reported that DNA testing showed the bodies are not the missing students, although tests continue. The federal government also did not respond to many warning signs regarding corruption and illegal acts in Iguala and the region. In a too-little, too-late measure, federal police were sent out to take control of thirteen municipalities suspected of ties to organized crime. Security forces under the secretary of the interior failed—by all appearances purposefully—to protect the students. But sweeping the scandal under the rug of oblivion and mass-media control is not an option in this case. This time, hundreds of thousands of youth throughout the country will not take spin for an answer. On October 22, Mexican youth and people throughout the world joined in demanding that the students be brought back alive. Nothing is as important as this demand. It’s essential for the families, for the reputation of the nation and for restoring a modicum of faith in the government. If the students have been murdered, their families have a right to know as soon as possible. After that, huge challenges will remain. 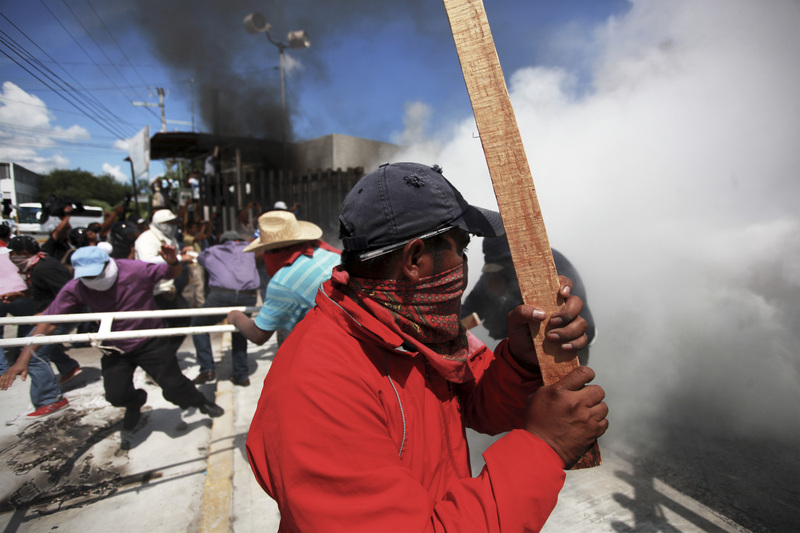 The Mexican government must begin to enforce the law, even against those with money and power. And the US government must finally face up to its responsibility to suspend the Mérida Initiative’s security aid to Mexican forces that murder their own youth.